The Rocky Horror Official Calendar Two Thousand & Nine published by Slow Dazzle Worldwide, here in the UK is now available (well on Amazon anyway!). "Featuring the legendary photographs of Mick Rock". The front cover of this year's calendar features Tim, Patricia and Nell. The Calendar is presented in as a 30cm x 30cm (12" x 12") page folding out to show the main image as the top half of a double page (60cm x 30cm), with the calendar section below. The calendar is also punched with a small hole to hang it on a nail. The middle pages of the calendar fetaure the main shot and nine of the monthly individual images repeated as a poster image, with each one framed with a "film negative" effect. Unlike previous years there is little in the way of additional images on each monthly page, with the dates presented on a diferent plain coloured background. Rob has more to say on this point in his review below. £9.99, although you may find it a little cheaper as Amazon were listing it at £4.99+delivery as of Sunday, November 16th, 2008. Slow Dazzle will be donating a portion of the proceeds of each sale to Manchester Children's Hospital on behalf of Richard O'Brien. This has been the case for all the previous releases and it is nice to see this worthy cause supported once more. Can it really be that time of year again? With our 2008 calendars barely half way through, Slow Dazzle have yet again produced the following year's effort, using photographs by the legendary Mick Rock as always. Unfortunately, as is becoming an increasingly annoying trend, most of the shots used this time have already been seen on previous calendars over the last six years. 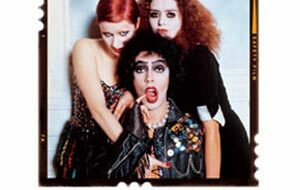 In fact, a quick comparison with the previous Slow Dazzle Rocky Horror calendars reveals that only three of 2009's images have not already been used before, which is a shame. I know that a portion of the money from the sale of these calendars goes to a very worthy charity, but surely the people who choose the images for inclusion must know that many of the same people will be purchasing them year after year as collectable items, and therefore continually recycling the same photographs (especially when Mick Rock himself must have hundreds we haven't seen yet) is quite lazy and disrespectful to the fans. Another disappointment this time is the lack of bonus images on any of the pages. One of my favourite pictures from the 2008 calendar was the black and white Usherette photo from one of the early Rocky Horror stage productions, which was printed as one of the smaller bonus pics in the calendar's centre-spread. The centre-spread for 2009 merely shows some of the same photos which are used for the main monthly images, and there are also no background pictures either (the actual calendar portion being printed against a simple plain coloured layout for each month this time), which again feels like a little bit of laziness on the part of the layout artist or editor, and makes the calendar itself look slightly less exciting than usual. On the plus side, as one would expect, the images themselves are absolutely gorgeous as always (Mick's photos are always a joy to behold, even if they are mostly the same ones year after year now), and I'd never be without my Rocky calendar to see me through another year. My personal favourite photographs this time are the classic shot of Frank with Riff's hair in his mouth for March, Magenta and Columbia looking cool and sultry in June, and July's pic of Columbia doing her spectacular high kick during the Floorshow (which is one of the images I don't think has actually been used on one of the previous calendars). Once again then, an essential purchase for anybody who is any kind of Rocky Horror fan, and I will of course continue to buy (several copies of) each year's calendar for as long as Slow Dazzle keep making them available, but I do think that loyalty such as our's should now be rewarded with some varied and different photographs. All images copyright Mick Rock/Slowdazzle 2008.